Acetone Free. Easy to take in your bag - Easy and lightweight for packing (you can't take bottles of polish remover with you on vacation anymore!!!). Usage: Gently rub a pad to get the polish off your fingers, Great for touchups. Perfectly portable Nail Enamel Remover Wipes. This is a nice way to 'take-along' nail polish remover without worrying about it spilling. Pretty cost effective as compared to buying a bottle of nail polish remover, these are quite portable and safe to carry when traveling. These wipes do a very thorough job of removing polish without stripping the nail and leaving it white and dry; the added bonus of vitamin E helps to keep moisture loss at a minimum; they're acetone free as well. Explore other options for Nail Polish Remover here. Explore the entire range of Nail Polish Remover available on Nykaa. 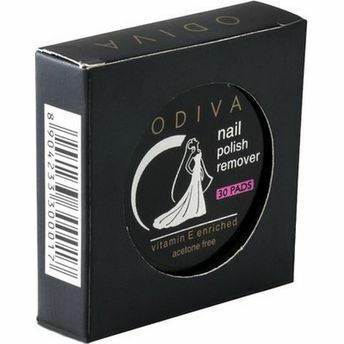 Shop more Odiva products here.You can browse through the complete world of Odiva Nail Polish Remover .